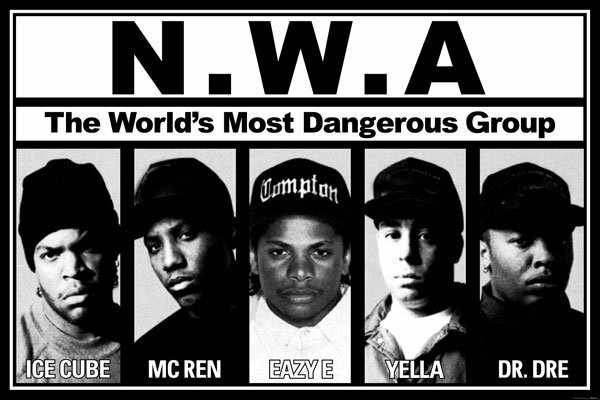 The NWA biopic Straight Outta Compton has run into a serious snag, and Fantastic Four is to blame. Michael B. Jordan, who set haters aflame when he was cast as Johnny "The Human Torch" Storm, was being eyed to play a young Dr. Dre in the drama about the trailblazing rap group. However, Fantastic Four's shooting schedule has made him unavailable. Now producers are scrambling to find a cast to play teen-to-twenty-something versions of Dr. Dre, Ice Cube and the late Eazy-E.
"After Michael B. Jordan, the list of black actors with big names in that age group falls off a cliff. The casting situation is kind of a mess right now. And now you have Ice Cube tinkering with dialogue." Universal is developing Straight Outta Compton, but it's a slow-going process. The project has not yet been greenlit, and none of its major roles have been cast. In an unusual move, this has not prevented the NWA biopic from shooting. Possibly in hopes of taking advantage of California's film tax credit, a sequence of the could-be movie was shot in Los Angeles recently. What kind of sequence can be shot when you don't have any of the leads cast? It turns out a post-credit sequence wherein the real Dr. Dre and Ice Cube talk about the legacy of NWA. This month the producers of Straight Outta Compton will go before Universal to pitch why the project should get the greenlight. But with open casting calls going out all over Los Angeles and Gardena to find suitable young actors, it's not looking good. Making matters more complicated is a lean budget of $25 million that will make it even more difficult to attract a star, even if one could be thought of. If you have any suggestions of who could play Dr. Dre, Ice Cube or Eazy-E, sound off in comments. It seems like Straight Outta Compton's filmmakers could use all the help they can get. We'd suggest Attack the Block's John Boyega, but of course, he's going to be pretty busy with Star Wars: Episode VII.